John Collings – Page 33 – A novelist with a passion for reading and traveling shares his view of the world and his adventures. Being a world traveler, I was instantly drawn to this book. Not only did the title include one of my favorite cities in the world, but it also promised a mystery with international intrigue. Opening the pages of the book, did not leave me disappointed either. Overall I would give the story four and half stars out of five. The story follows a young lady, Hana Silna, as she travels by herself to Prague to claim a home she has just recently discovered was in her family before the Communists took over. The government of the Czech Republic has been trying to return these house back to their rightful owners, but it takes time due to the fact that many of the records are either lost or very old. Hana would love to come back and claim this family landmark with her mother, but due to a rare disease that has hospitalized her mom, Hana is forced to do this on her own, or so she thinks. The heroine soon finds herself in the middle of an international mystery that involves Americans, Russians, ancient royalty, and gypsies as tries to find Edward Kelley’s buried flask. This is no ordinary flask, but contains a powerful potion that gives certain imbibers of its precious liquid eternal life. Some people want to use the flask for good, whereas others want to use it for their own selfish gain. 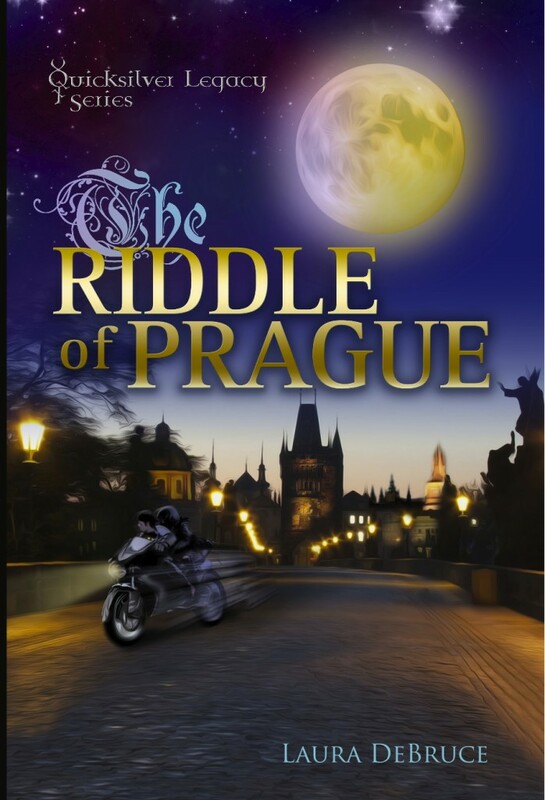 The problem is Hana can’t figure out which one is which as she looks for help in unraveling the Riddle of Prague. I thoroughly enjoyed this story. From the flight over to Prague to the very end, Laura DeBruce left the reader guessing as to what exactly was going on and who Hana could trust in her endeavors. My favorite part was she set in one of the most amazing cities this world has to offer. The location become a character in itself as you are transported to some of the more iconic locations that Prague has to offer. The history it delves into focuses on the Bohemian nationals and their interaction with the gypsy culture. There are a lot of characters to follow and sometimes I got confused as to who was who, but this also added to the mystery because it left you wondering who was the good guy and who was the bad guy. The slight elements of fantasy that Laura DeBruce intertwined with her story were subtle which added to the charm of the ancient city rather than try to include this element to make the story fit around it. A love triangle also was not overdone so as to turn off male readers, but felt natural in its design. Overall, the biggest problem with the novel was the use of the Czech. Not many people know this seldom used language, and Laura DeBruce could have given the reader more insight earlier on as to what the character were saying, but that is such a minor problem in an otherwise fantastic story. The mention of another of my favorite cities of the world, Dubrovnik, made me excited for a sequel to this book even though it looks like she might be holding off the use of this place until the finale. I still look forward to the second book, and highly recommend that you get started on this series while Laura DeBruce works on its next installment.